Having Breakfast with Steinbeck the other day got me thinking about all the questions I have regarding our food choices in this country. I don’t usually like to cause a ruckus, but nothing gets under my skin more than the way our food is produced, packaged, and promoted. So I’m fighting back. In my way. I’m fighting back by buying local and knowing how my food is grown or raised. Countless people I know have the same questions about genetically modified foods, factory farms, pesticides, chemicals, and all the other scary ways our food is industrialized these days. Many even ask me questions as if I’m an expert, or tell me they watched a documentary that changed the way they think about food. I’m always beyond ecstatic that this little blog might influence even one person to eat healthier or shop local. Now there’s another way to fight back. 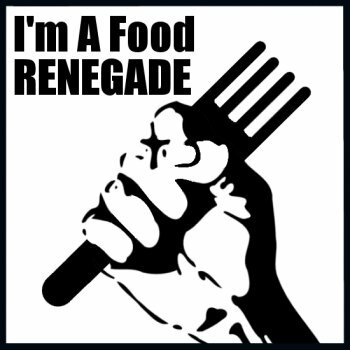 Become a Food Renegade. Acting on a tip from my sister-in-law (a.k.a. the cutest pregnant woman on the planet) I checked out Food Renegade on Facebook, followed by a long look at their website. It’s like they’re doing all the research for me. If you haven’t heard of them, check them out! For all the bloggers out there, they offer a blogging carnival called Fight Back Fridays. If you are fighting back like I am, join the revolution; it never tasted so good! I clicked on the cutest pregnant lady in the world and got no further. Sorry. Or maybe you’re saying she’s NOT the cutest pregnant lady in the world. Not cool. I agree. Sometimes procrastination has its benefits. I’m sure you’re a great project manager. And if people think you aren’t, put on the stache glasses–instant authority.